Americans express their view on Thanksgiving Day shopping, courtesy of Rich Relevance & CBS News. As time propels us forward into holiday season, jcpenney announced that they will be opening their doors at 5 pm this Thanksgiving. According to RichRelevance and reported by CBS News this morning, America doesn’t agree. 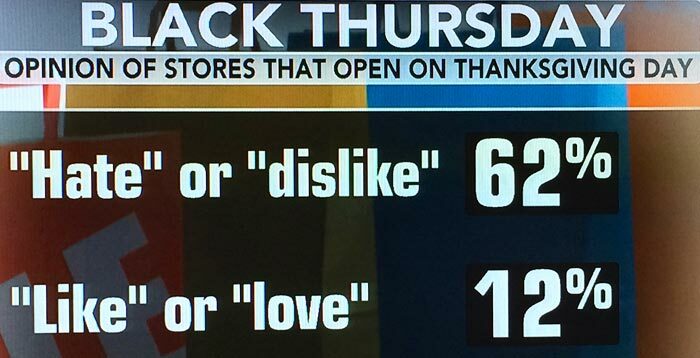 62% of Americans polled either “Hate” or “Dislike” the idea of stores being open on Thanksgiving. Only 12% said they either “Like” or “Love” the idea. 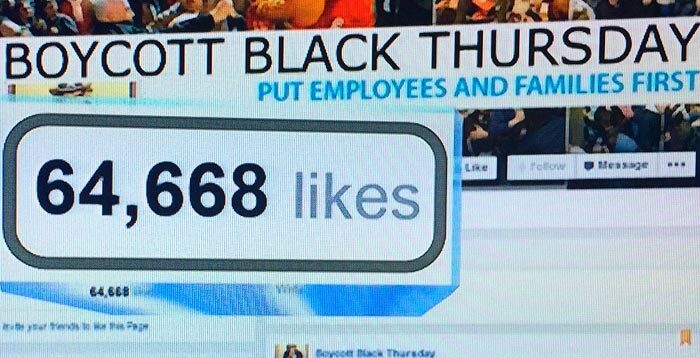 “Boycott Black Thursday” Facebook page has almost 70,000 likes. 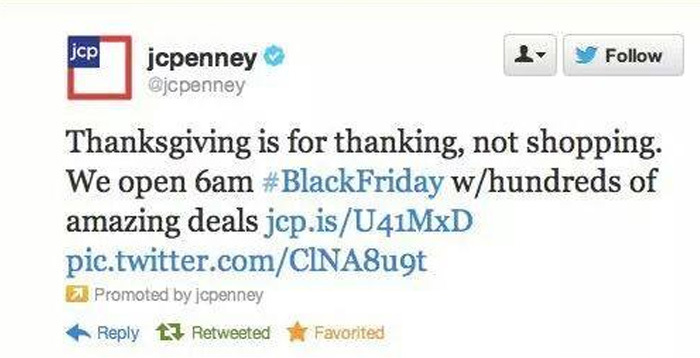 Former JCPenney CEO’s Tweet two years ago: a call to put family and employees first. Almost two years ago, then jcp CEO Ron Johnson boldly bucked the retail trend by closing his 1,100 stores on Thanksgiving, announced through a tweet that said: “Thanksgiving is for thanking, not shopping…We open 6am on Black Friday.” While lambasted for attempting to bring simplicity and fairness to retailing by losing the gimmicks and chicanery so typical in retailing today, Ron was clearly ahead of his time, in more ways than one. I surely hope that the polls and groundswell grass-roots efforts mean that Americans are finally coming to their senses and recognizing what’s truly important.